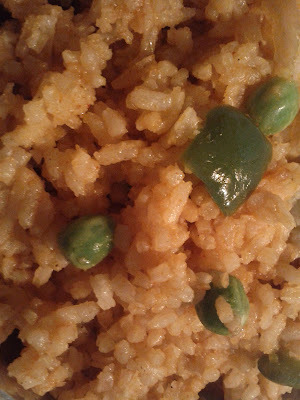 Schezwan Fried Rice is a Indo-Chinese recipe. Spicy, hot and filled with flavors. Fried rice is a very simple and easy recipe made from steamed rice stir-fried in a wok, often with other ingredients like vegetables, egg and meat. Schezwan fried rice involves a process of making schezwan sauce and adding the steam rice into it. This is almost everybody's favorite dish and so is mine. Love to have it during rainy season. Can add boiled chicken, mutton or egg along with other vegetables. Number of green chilies depend on how spicy they are. I am using 3. We are not using any hot spices. Optional - Can use coriander leaves and spring onions at the end to garnish. I am non adding exactly 2 glass water for 1 glass rice grains so as to prevent it from getting overcooked. In a cooker, add rice grains and salt and cook rice. Allow it to cool a little. Make a paste by adding red chilly powder to little water in a bowl. Heat oil in a wok or broad non-stick pan. Add garlic, ginger and green chilies. Fry it until the color slightly changes and then add Onions. Fry until it changes its color to brown. Add salt, sugar, soya sauce, tomato chilly sauce, red chilly paste and pepper powder. This is called schezwan sauce. Add little water to it and leave it on high flame. When it starts to boil add all the vegetables( carrots, beans, capsicum, cabbage and green peas). Fry them on high flame for 3 minutes. (If needed, can add egg, boiled chicken or mutton at this step). Add cooked rice. Mix well and check for the taste. If needed add little soya sauce, pepper powder and salt.